If you haven’t heard of the JamStik yet, chances are you will in the coming months. It’s a 15-inch MIDI device (short for Musical Instrument Digital Interface), and it includes actual strings on it to teach aspiring guitarists everywhere how to fret, strum, and more via their iOS device. Like our ultra-portable speakers, JamStik can go anywhere with you. It connects to iOS devices like the iPhone and iPad and outputs a MIDI signal that can be used in a battery of audio programs, from Garage Band to Sunrizer. The device is super simple to use — it teaches users how to play guitar by following their hands as they fret and showing if the user’s hand position is correct or not on the device itself. What’s really cool about JamStik is that once you get good enough to play some songs, since it’s being run through the iOS device, you can actually rock out through one of our Bluetooth speakers to project a deeper, more clear sound — and all without attaching a single wire (unlike the picture above which unfortunately features a Beats Pill speaker)! 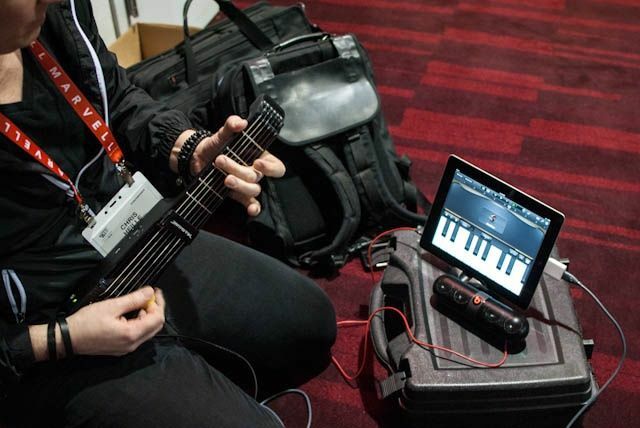 The JamStik is a portable digital guitar that connects to your iPad or iPhone! We use light to scan your fingers as you press REAL STRINGS to REAL FRETS and use REAL PICKING technique to play, then send that information over to your device in real time to take some of the frustration out of learning to play and put some fun back in! JamStik has already surpassed their $100,000 goal on virtual crowd funding site indiegogo. What do you think — the real deal or much ado about nothing?